At the beginning of this contribution to the 19th European Schools Project (ESP) conference I would like to comment the situation of the ESP in the Czech Republic. I have to admit that after more than 10 years of the continuous propagation of international cooperation in education we still can’t be satisfied with the situation in this field. At the majority of the schools in the Czech Republic the project work is considered to be mainly an additional financial contribution to their budget or a travel opportunity. This is the reason why they are interested, above all, in grants (often Comenius 1). It is really very difficult to find any teacher who does some international cooperation purely for its didactical profit. The logical consequence of this situation is the insufficient educational input of the international projects in average. This has a significant impact on the requirement in the teachers training. Unfortunately, up to now we often receive only the request of the school managements for the training in the grant proposals writing, nothing more. The Czech activities within the ESP under such conditions are not easily proceeded, but, generally, their realization is very important. In the current Czech educational projects domain, the ESP serves as a theoretical basis, a model of desirable didactical quality, and a prototype of good and proven practice. We can see the existence of the ESP in the Czech Republic as a chance promising the right development for the future. Another problem is connected with the current unofficial organizational status of the ESP. As such, it is not recognized by the University authorities. This doesn’t allow declaring the ESP as an official partner of the Charles University and the work of the national coordinator remains for all the time only on voluntary basis. Hopefully, the coming foundation of the ESP association could help here. Until now the only possibility to support indirectly the ESP movement from the position of the Czech national coordinator and a university teacher at the same time, has been the involvement in topically affiliated, but officially recognized activities in the field of projects coordination, teachers training or research. These are namely the projects Comenius 2.1 PROMISE, Comenius 3 ECOLE and COMP@CT, international IEA research SITES and the special research programme of the Charles University Faculty of Education called “Education for the Life in Information Society”. Several outcomes of the above-mentioned activities are particularly beneficial for the project methods in general. The recent educational research  proved that the shift from traditional to emerging practices – the same which is intuitively supported by the ESP for more than 15 years – is under way on the global scale around the whole world and has the right impact on the required competences of the forthcoming generation. The innovative educational methodology is often characterized as a problem-oriented or student-centered. The role of the teacher is changing in spirit of the English idiom “guide on the side, not sage on the stage”. This process of innovation is described as the shift from instructivism to constructivism . The emerging constructive practices are typically represented by the educational projects. This term features really a very large range of often very different school activities, in which the students take the control of the work in some way. As mentioned above, the ESP has operated in this field focusing on projects supported by modern technology for many years. Until the end of the 20th century the theoretical background of the conventional projects was derived solely from the teaching traditions of certain countries, or from some attempts made by experimental schools. Together with the increasing deployment of technology in schools the need for the appropriate didactical modification in field of project methodology raised. 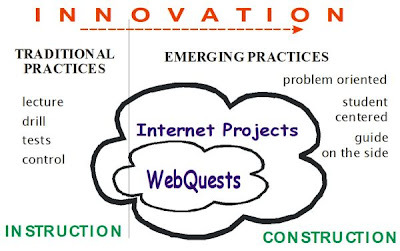 Thanks to the ECOLE project, the classification in the form of the Taxonomy and Examples of Internet Projects was realized in the 2002 (http://omicron.felk.cvut.cz/~bobr/role/projects/). Based on this classification, the ECOLE project could later continue with the description of the best projects practice. This domain is still very topical and currently results in the new Comenius 3 proposal titled “Best Experiences for Students and Teachers in ICT-Innovation”. We have felt that the Czech teachers need something more than just information about the variety of project types complemented by the recommendations for the best methods. In the situation when there is only a little chance to involve significant amount of teachers in the project work training aiming at reaching the best project quality, we decided to promote our activities also by other means. We have tried to provide the innovators among teachers with the free tool for designing such lessons, which completely meet all the stated requirements for the modern emerging practices. This is WebQuest.cz. It is evident from the definition that the WebQuest is a special kind of project strongly supported by the technology. Depending on its content it could belong to several categories in our Projects Taxonomy – 2.4. Telefieldtrips, 3.1. Information Searches, 3.6. Simulations – and maybe even more (see the linked description). The main difference to the common ESP or Comenius international projects is in its independence on workmates out of the school. The project activity here is based mostly on the cooperation inside the classroom using information from the recommended sources outside. It is initiated and guided by the teacher. The WebQuest implementing teacher doesn’t necessarily need to be the same person as the author. One of the positive principles behind is the altruism of the authors. The big majority of WebQuests is published on the Internet for the disposal of all teachers. The considerable part of the tasks connected with the WebQuest implementation could be done by mobile devices – the main theme of the conference. It is possible to consider the WebQuest as the modern form of a traditional lesson. But it is important to keep in mind that it is not the same. The difference corresponds to the difference between the instructivist and constructivist approach. The task behind WebQuest must initiate the individual activity, often in cooperation with classmates. This principle needs to be somehow embedded in the assignment. To succeed here and to fulfill the educational goals at the same time is the heavy duty of the innovatively thinking teachers. Not only students, but also the teachers need some kind of guidance in this heavy work. This is what they can get through the well-proposed didactical background of the WebQuest theory. The following table shows the recommended theoretical structure of the WebQuest based on the original materials developed by Bernie Dodge and Tom March in middle 90’s (see also the online Materials for Teachers below). The purpose of this section is to both prepare and hook the reader. The student is the intended audience. This section outlines how the learners will accomplish the task. Description includes clear steps and tools for organizing information. Links to recommended usable online materials or other sources (in simple cases it could be incorporated in the previous section). This section describes the evaluation criteria needed to meet performance and content standards. The conclusion brings closure and encourages reflection. The teacher page includes information to help other teachers implement the WebQuest, including: target learners, standards, notes for teaching the unit, and, in some cases, examples of student work. The development of a WebQuest in the form of Web pages, even if the templates in HTML exist, is not always easy for the teachers. Not many of them are able to manage all the work necessary for the content authoring, HTML files editing, and final publishing on the Web server. Moreover, in the Czech situation, there is not only the lack of technologically literate teachers, but even the lack of pedagogy innovators. Therefore we came out with the intention to make the development of WebQuests as easy as possible for all testers, which are ready to try it. The idea was to offer teachers the WWW service (WebQuest.cz) that brings together the advantage of Web Publishing System and Open Source Database. The main task of the Publishing System is to provide the users with the content authoring, management, and publishing of all WebQuests’ components. The database deals with the description of every WebQuest in form of metadata with the aim to facilitate the search for the appropriate teaching material. The Archive of already published WebQuests includes not only the searching function, but also the sorting and filtering tools working over all materials by the given criteria (subject, students’ age etc.). Not-registered visitors of the WebQuest.cz site can see all published WebQuests, read the local supporting theoretical materials, and visit the selected linked original English pages. After the registration the user is allowed to set up a new WebQuest, develop it, and publish the final version for public disposal. In the authoring phase, the user gets the empty structure of the WebQuest components, where every section is represented by the article of the Publishing System. The author can either accept the given structure, or is free to modify it, add folders, articles, files, etc. The other feature of the WebQuest.cz services lays in the support of the school practice. All logged users can make an assignment from any WebQuests already published. In this mode the teacher obtains an access code for his/her students. With this code the students can log in and use a special mode of system environment, where the original WebQuest is displayed, and they have their own folder at their disposal. Students can publish all their findings and outcomes in form of articles or files here. It is up to the teacher’s decision whether the students’ folder is made public or not. So not only the teacher could see it and evaluate it. The proper WebQuest tasks may often have also such outcomes that can’t be simply saved in the form of an article. Such activities like live presentations, performances, discussions, simulations, etc. still can be in a limited extend documented by certain multimedia facilities (e.g. video). By these means almost all the classroom activities can be in some way presented by the WebQuest.cz system. Utilization of this capability could increase the motivation of students in a significant extent. The important additional feature of the system is the supporting structure of discussions. On the top, there is an ordinary FAQ functioning as one way response of administrators complemented by the general forum of all users. In addition to that every WebQuest and every assignment has its own discussion group of the users or students involved . The main reason for the development of WebQuest.cz service was to make the most out of all the research activities taking place at the Information Technology Department at Charles University Faculty of Education. As the goal was to strengthen the innovative methods of usage of the educational technology in Czech schools, only the Czech language is supported by the current version. Nevertheless, the application is prepared for the possible implementation of other languages versions in future. The system was launched a moth ago, so it is too early to evaluate its content and public contribution. We are undoubtedly aware of the difficulties connected with the successful application. The problems of the satisfactory use of the tools like WebQuest.cz have two levels. Both are connected with the teachers. First one is the time shortage, which is significant for the majority of teachers. It is really not easy for them to find enough time and energy to design the high-quality WebQuest in its full complexity. The creation of a WebQuest could be, in terms of the workload, compared to writing a chapter of a textbook or a whole research study. No surprise that the teachers don’t hurry to carry on with such activities as their extra job. On the other hand the ambition to show his/her own qualification and to offer the best practical ideas to others is often a good motivation. The second problem is linked with the right understanding of the current innovation of education as it is described by shift from instructivism to constructivism. The power of the publishing system, even with the pre-designed WebQuest structure, is no guaranty of the real innovation. The tool itself could be used in many different ways. There is a real risk of a traditional approach to the Webquest designing that would rather resemble the old instructive lesson, or the teacher may show some other signs of misconception. Therefore the propagation of such a tool has to be complemented by the teacher training scheme. Fortunately, the offer of relevant courses exists in the Czech Republic. Our course of project methods supported by technology has been accredited by the ministry and it is going to be offered within the official program of State Information Policy in Education. The first month of WebQuest.cz service showed that most of the pathfinders among the pilot users were interested mainly in unfilled technical trials of the system functions. Up to now only a few usable WebQuests were finalized. In spite of it we believe that among the one hundred currently registered users, there is a significant number of those meditating about the content of their first regular WebQuest right now. If nothing more comes, a fact of closer familiarization with the given issue would also be beneficial to them. We hope that we at least indicate one of the proper ways for the appropriate application of modern educational technology in the Czech Republic. Good job with the write-up.